Cucumbers are known as “yellow gourds” (黃瓜) in Chinese. They are sometime also called “baby yellow gourds” (小黃瓜). I’ve always wondered why they’re called “yellow” since cucumbers are obviously green. Even with all the different varieties, they are all still green. But a few years ago while having dinner at a relative’s home in Hong Kong, her cook served a soup made with a wrinkly yellow-brown skinned gourd with slightly green flesh that she announced was mature cucumbers. That’s when I realized why cucumbers are called “yellow gourd.” They turn into a yellowish gourd with tough dry skin when mature. The term “old yellow gourds” (老黃瓜) explains why the green cucumber is often known as “baby yellow gourds,” differentiating the two. I was actually quite relieved, in my neurotic way, by this revelation after years of wondering if I might be somehow selectively colorblind. Moreover I recently learned a Chinese proverb that refers to an older person who pretend to look young as “a mature cucumber painting itself green” (老黄瓜涂綠漆… 裝辣). It just shows how much there is to learn about cucumbers. Mature cucumber, as it turns out, is regularly used for making soup in Cantonese cooking. It is classified as a yin or cooling ingredient, and being abundant in the summer, is commonly used to help cool the body and prevent heat stroke during the hot season. Other yin ingredients including tangerine peel, carrots, and beans can be added to increase the cooling and other medicinal effect. 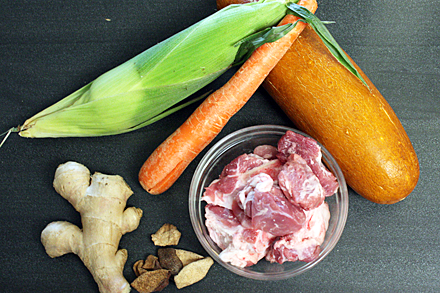 And to make the soup even more appetizing pork, chicken or other poultry meat is added to enrich the soup stock. The other key to success for slow cooking Cantonese soup is accurate temperature control. The soup should be simmered very slowly, where the liquid is just barely bubbling, for one to two hours. 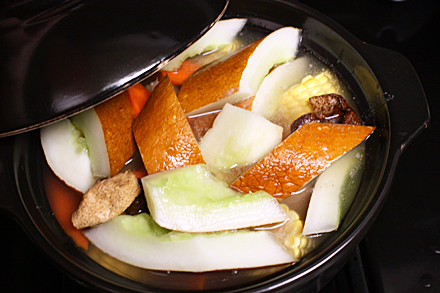 The best way to maintain the perfect steady temperature is to cook the soup in a clay pot. A covered clay pot that comfortably contains all ingredients are ideal as it retains and distributes heat evenly through the soup. The Cantonese are well known for making great soups. In fact the terms for slow cooking soup, “bao tang” (煲湯) in Mandarin or “bou tong” in Cantonese, are enduringly attached to Cantonese cuisine. 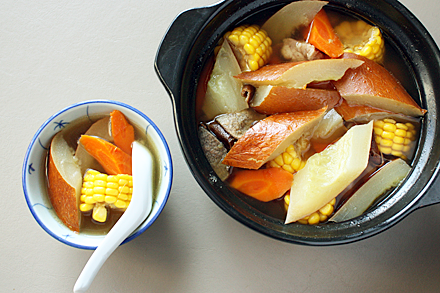 A Cantonese dinner in a restaurant or at home is never complete without a pot of soup. So it is natural that mature cucumber is one of their favorite summer soups. In my recipe for mature cucumber soup I’ve chosen to use corn, carrots and tangerine peels in a pork bone stock. It is a typical combination and has a very pleasing herbal aroma. 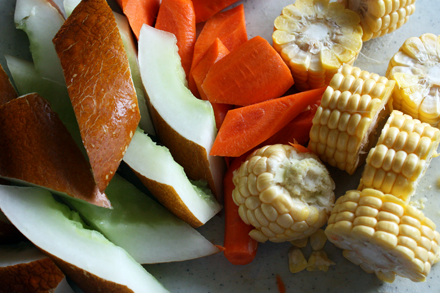 Try this summer soup to get some relief from the sweltering late August heat. 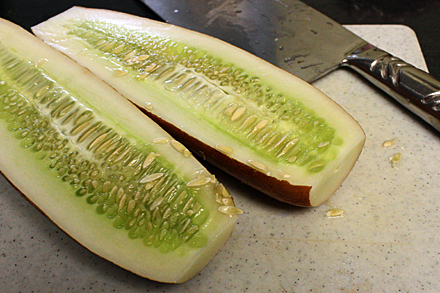 Cut the mature cucumber in half lengthwise and remove the seeds. Then cut into squares of about one-inch. Do not peel the cucumber. Remove the husk from the corn and cut it in cross sections of about one inch thick. Peel the carrot and cut into irregular one-inch pieces. Bruise the ginger by pressing down with the blade of a knife and crushing it. Bring two quarts of water to a boil in a medium pot and parboil the pork bones for about 15 minutes. Drain the pork bones and rinse thoroughly. 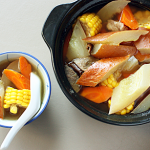 Place the pork bones, mature cucumber, corn, carrot, tangerine peel and ginger in a four-quart clay pot. Add three quarts or water to the clay pot. Put the clay pot on the stovetop and bring the water to a boil. Immediately reduce the heat so the soup is just barely bubbling. Cook for one and a half hours. Turn the heat off and season the soup with the salt and ground white pepper. 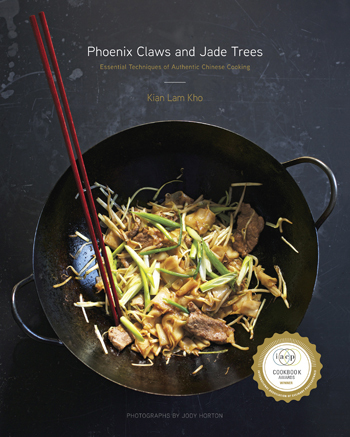 Serve piping hot in the clay pot. I’ve made this soup a few months ago! I’ve discovered 老黄瓜 since moving to Guangzhou, and I find the color is really beautiful. Wow. Never knew you could eat those. And the soup looks really great! Thank you for sharing! Am making it a second time today. Its so good. Thank you for the recipe & the information. ps did not know fresh or dried tangerine peel. Used fresh. Turned out well. I’m glad you enjoy the soup. Dried tangerine peel has a much more intense flavor. I would suggest that you save the peels of fresh tangerine and dry them in a cool oven of about 150 degrees F. You may have to dry them for a few hours. Enjoy! I am looking for the list of the names of older cucumbers!! They ALL seem to be hybrids now and that wasn’t what I was looking for. I found a site with pictures of older varieties, but NO NAMES!!??? Looks like a conspiracy to prevent people from growing the older varieties that are their favorites!! Hi i live in san franciso. My grandmother has 3 months to live from cancer. She been craving for some old cucumbers. Any idea where i can find it or if anyone can mail me some? So sorry to hear about your grandmother’s illness. I live and New York City and I’m afraid I can’t give you firm recommendation for grocery shopping in the San Francisco area. I often find lots of good markets in the Clement Street area of Richmond neighborhood. Old cucumbers are most commonly available during late summer or early autumn.